Victor Amisi is the CEO and founder of Vision GRAM-International. Vision GRAM is an organization that provides resources and rehabilitation to decommissioned child soldiers in the Eastern part of DR Congo as well as victims of sexual violence due to war. In a recent trip to NYC Vision GRAM-International participated in the discussions of gender and disarmament in regards to changing the dialogue on experts in the field being only male with the organization Control Arms. Mr. Amisi sat down with this journalist to answer a few questions about his work in DRC as well as the international struggles that have plagued the region for many decades. JF: You grew up in Eastern Congo. Was there ever a time when you knew peace there? What was the community like in times of peace when you were growing up? VA: As a child in Eastern DR Congo we experienced a long period of peace. I had not experienced war. Communities were united and no one was aware of the problems between communities. There was a common sense of cohesion and a peaceful coexistence among neighbors. Being young, I could not distinguish the difference between the communities. I grew up in an area where several communities were combined; even foreigners from neighboring countries were part of our communities. JF: Rwanda and Uganda have long been involved in destabilizing Eastern DRC in search of minerals for money. How has their involvement changed the landscape and the people of the region? VA: The involvement of Rwanda and Uganda in conflicts in D R Congo changed this cohesion between the peoples. The Rwandese communities living in Congo had returned to Rwanda after taking Kigali in 1994. Rwandans who were born, grew up and spent several years in DR Congo were suddenly backed with arms from outside governments to support rebellions whose goal was to destabilize the region and profit from the rich mineral resources (RCD/Goma, CNDP, and M23). Hatred against communities that were part of the rebellion took hold, attacks between the Banyarwanda and local communities began, the resurgence of the militias wanting to resist against foreign aggression. Due to the years of ongoing conflicts the social climate is not good in the region. The violence brought on by these wars has caused mistrust among many groups in the area and has become a reality of daily life. JF: The regional news is mostly dominated by violence from Eastern DRC; does the western part of the country know how the Eastern part suffers? Is Western DRC aware of the atrocities committed by Rwanda and Uganda? VA: All parts of the DR Congo were aware of the situation in the country and this has affected everyone in DRC. However, at the beginning of the events, some people in Western countries said it was a matter for the people of the East with their neighbors and cousins ​​from Rwanda. In analyzing the situation closely, the west emphasizes the political struggle and seeking positions therein, while to the east the fight was the focus of the army. That is why, there are several armed groups who believe to claim their rights by the armed forces. Distrust is visible between the West and the East who treat each other as traitors, but all are aware of the atrocities committed by the Rwanda and Uganda. They should put their efforts together to denounce the actions of these neighboring countries though through civil society and action in this manner should be encouraged. JF: What are the greatest challenges facing the communities you work in in Eastern Congo? What is needed to help relieve these problems? VA: The biggest challenges for communities are the uncertainties about their future due to the presence of armed groups in some villages. Families are living from day to day, work is insecure, and desperate poverty is a daily reality. The populations affected by armed conflict are in a difficult situation; so the reintegration of former child soldiers and victims of sexual violence is another big challenge. Psychological support to treat trauma victims is needed on a larger scale, economic reintegration for affected families to facilitate relief and seeking justice for the rights of victims. We face these challenges on a daily basis throughout centers in the region. JF: Vision GRAM International has been instrumental in the negotiations of a strong Arms Trade Treaty. What would the ratification of this treaty mean to Vision GRAM International and Eastern DRC? VA: Vision GRAM-International has been involved in the ATT process from the beginning of negotiations. 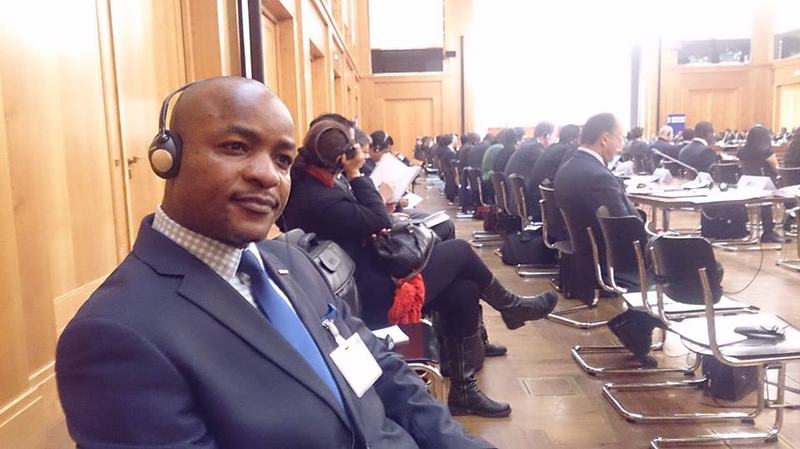 The focus is on advocacy with the Congolese government to get involved in this process. Particular emphasis was placed on educating the public about the effects of illegal trade in weapons on civilian populations and the dangers they pose to the public. Vision GRAM-International has worked hard for the rights of survivors and are part of the Treaty. This treaty is the result of a long struggle and a victory for Vision GRAM-International. We are aware that the long journey will begin once it is in place in or to monitor its implementation. The ratification means a lot for a country that had the bad experience of war by the presence and movement of illegal weapons. This treaty is binding, is sturdy and provides hope for the victims of armed violence. Despite its adoption, its signature and ratification, it is disappointing to see that DR Congo has suffered atrocities and has neither signed nor ratified the treaty. I wonder what these authorities are thinking about. Also disappointing is that the government of Canada, my home country now, did not sign and ratify this important treaty. JF: Why has Vision GRAM International worked so tirelessly to create this Arms Treaty? VA: By focusing on victims of gun violence, Vision GRAM-International has invested to give voice on the international level in collaboration with other organizations. The purpose of this involvement was to help to reduce the suffering of the civilian population and to advance the process for states to take responsibility. Vision GRAM-International believes in the Arms Trade Treaty because it is an international legal instrument that will force states to take responsibility to protect civilians and ensure security in the region and peace in the world. JF: What does the international community not understand about DRC? What popular distortions continue to get reported? VA: Despite the intervention of the international community to resolve conflicts in DR Congo, there are important elements that should be included. To the east of DR Congo, there are land issues that create tensions between communities. Leaders do not seem to emphasize this aspect because they believe in cohesive communities, but in reality this is not the case. Cases of assault reported by the populations have not been considered by the international community to act quickly. The slow response of the international community to these situations exacerbated the climate of trust among the population. Obviously, in the popular misinformation there is something worthy of report. The public is not well informed of the exact and specific role of the international community with some issues of the day. This is why people sometimes accuse them as complicit, lax by this silence. An information campaign should be strengthened among the population. JF: Can the international community help bring peace to the region and stabilization? VA: The international community should work closely with all parties of conflict, including all segments of civil society at local and national levels. But, action should be extended to the regional level, because all neighboring countries are involved in the problem, having experienced the same problems. When discussing the ethnic problem, this applies to all neighboring countries. Governments are in a crisis of confidence and trust between them with the resulting crisis between peoples. So a regional approach must be taken into account to prevent armed violence and facilitate the development of the region. And the role of the international community to facilitate the realization of this approach. JF: As the 2016 election approaches, in your opinion, would a change in government help Eastern Congo and relations with its neighbors? VA: I think the change of government in the DRC would provide a solution for the Eastern DR Congo and its relations with its neighbors only up to a point. The problem is not just the people in mind. These are the institutions that must be strong in the country. Internal politics can change, of course, but the impact will not be seen in relations between neighboring countries as the people in these countries who live in a climate of mistrust created by politicians. Unfortunately leaders of the current governments from DR Congo, Rwanda and Burundi, as they prepare for the elections, do not seem to want to let go of power. They have to try the alternative to see how it goes.